Gold medals may not be the only thing at stake for the next few weeks in Sochi, Russia. The Olympic Games, which air on NBC, could also affect the contest for morning news ratings, which ABC has dominated since the last Olympic Games in 2012. For years, NBC’s Today show had been the gold standard, winning the morning news ratings for 852 consecutive weeks. But ABC’s Good Morning America forged into the lead in 2012 and widened it in 2013 and early 2014, although there have been some weeks when the competition has been close. One question now is how many Americans will go to sleep with the Olympics and wake up with Today – and whether it will be enough to reverse ABC’s morning momentum. 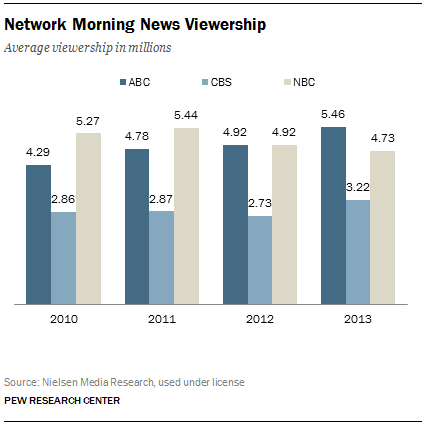 For all of 2012, Good Morning America edged out the Today show by the smallest of margins, about 700 viewers on average. (Those numbers reflect the first hour of each show.) But in 2013, that lead grew significantly as GMA’s viewership increased by 11% while Today’s decreased by 4%. In January 2014, GMA’s lead widened further, as it attracted 848,000 more viewers than Today. Meanwhile, CBS’s third-place morning show grew its viewership by 18% in 2013, after completely revamping the program in 2012 by hiring a new set of anchors and renaming it CBS This Morning. ABC first broke NBC’s long winning streak in April 2012, but the Olympics (from July 27-Aug 12, 2012) pushed the pendulum back toward Today. The first week of the games, it beat GMA by 1.6 million viewers and then won again by 1.5 million the next week. But the week after the Olympics, GMA regained the ratings lead, essentially for good. Deborah Turness, the president of NBC News, told the New York Times in January that her top priority was “to rebuild the [morning] show and get it back to the top.” But even if Today is able to win the ratings race during the Sochi Olympics, that lead could be fleeting. After the summer games ended in 2012, Today didn’t win another day in the official ratings until late June 2013, when Matt Lauer scored an interview with cooking personality Paula Deen after some racially controversial statements surfaced.